Recycle, conserve and sustain! These words have become all too familiar in the ever-developing United Kingdom where these countries strive to keep their environmental footprints to a minimum. Statistics provided yesterday by league tables project that Bristol has become the new recycling capital of the UK. Bristol beat out the former recycling capital of Brighton and Hove which was rated highest for the quality of life, yet fell to second place in the recycling category due to a poorer performance on the environment. Interestingly, data provides that there seems to be a north-south divide with regards to the quality of life. Southern cities prove to perform better in this category. Scotland’s highest ranking city on the recycling index is Edinburgh. Edinburgh ranked sixth place as a sustainable city and beat out other popular cities in the United Kingdom such as Sheffield and London. Peter Madden, chief executive of the Forum for the Future, said Britain should be an ‘inspiration’ for other countries. Although Edinburgh is ranked sixth in comparison to other cities in the United Kingdom, it is certain that this city will aspire to rank higher in the future, perhaps edging out rivals such as Bristol and Newcastle (ranked 4th this year). The Edinburgh Sustainable Development Partnership (ESDP) works as a voluntary and private sector organization that comes together to promote such sustainability in Edinburgh. 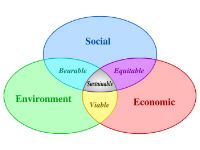 Sustainable development currently does not have a precise definition but tends to “seek a balance of economic, social and environmental concerns in order to ensure a quality of life both now and in the future,” according to the ESDP. Therefore, the main goals of this organization are based on raising an awareness and interest in the subject and to work with other organizations such as the Edinburgh Partnership Group to actually establish sustainable development in Edinburgh. Everyone, even you can help Edinburgh rise in the rankings for next year! Posted in Life and Society and tagged Edinburgh, sustainability. Bookmark the permalink.